Are your teeth crooked? Do you have trouble brushing and flossing? In public, do you hide your smile because you don’t like the way that it looks? Have you ever looked at your smile and wished you could change something about it? You’re not alone. More and more, adults are choosing to improve their smiles with cosmetic dentistry and Invisalign. In fact, I’m one of those adults. Since the age of 14, I was self-conscious about the spaces between my front teeth. Then one day, I decided to do something about it. After carefully researching my options for improving my smile with cosmetic dentistry, I chose Invisalign. Within the first two months I began to notice a change in my smile – the spaces between my front teeth were closing! Looking back on my journey, I am very happy with my results and would not have done it any other way. In fact, my personal experience was so positive that it inspired me to become an Invisalign provider. Invisalign is the modern alternative to braces that helps people achieve the smiles they’ve always dreamed about without metal brackets or wires. The aligners (clear retainers) offer a more discreet way to correct your smile than traditional braces. There are many advantages over traditional braces. You can take the aligners out, which means there are no limitations on the food you can eat, and you’ll never have to worry about food getting caught between the wires and brackets of braces. 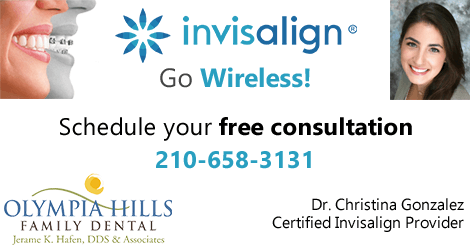 If Invisalign is a treatment that you are considering, come to Olympia Hills Family Dental for a free consultation to learn if you are a candidate. I will meet with you personally to discuss your options. We offer zero down, zero interest for 24 months through Care Credit for qualifying candidates. Schedule your appointment today and we’ll show you dentistry worth smiling about.